levo-Menthol is an important flavoring chemical, which can be prepared by enantioselective enzymatic hydrolysis of dl-menthyl esters. A recombinant esterase (BsE) cloned from Bacillus subtilis 0554 shows excellent enantioselectivity to dl-menthyl acetate and has been immobilized using cross-linked enzyme aggregates. Though BsE has relatively high substrate tolerance, the conversion of dl-menthyl acetate decreased sharply with the increase of substrate loading from 1 to 3 M in mono-aqueous system, which might be due to the severe inhibition of enzyme activity at extremely high load of substrate or product. In this work, enzymatic hydrolysis of dl-menthyl acetate with an extremely high load using the immobilized CLEA-BsE was investigated in an organic-aqueous biphasic system containing surfactant to establish a promising bioprocess for large-scale production of l-menthol. An efficient biphasic reaction system of pentanol-water containing sodium dodecyl sulfate (SDS) was developed for improving enantioselective hydrolysis of dl-menthyl acetate to produce l-menthol by immobilized BsE. Under the optimized reaction conditions, l-menthol was produced in >97% enantiomeric excess (ee) at a substrate load of up to 3.0 M with >40% conversion. All the positive features demonstrate the potential applicability of the bioprocess for the large-scale production of l-menthol. Menthol is an important cyclic monoterpene alcohol having eight optical isomers because of three chiral centers. Among them, l-menthol is not only one of the most important flavoring chemicals used extensively in oral products, pharmaceuticals, tobacco products, confectionaries, and shaving products ,, but also a useful chiral resolving reagent ,. In the past two decades, the global demand for l-menthol increased sharply from 6,300 to 20,000 t , and the production of l-menthol by extracting from mint can no longer meet the market demands. Therefore, considerable efforts have been devoted to the production of l-menthol by synthetic or semi-synthetic method. Symrise Incorporation (Germany) first developed a chemical synthesis process for the industrial production of l-menthol using thymol as a raw material ,. Later, Takasago International Corporation (Japan) developed an elegant route from myrcene based on the catalytic asymmetric isomerization of geranyldiethylamine by using a chiral catalyst (S)-BINAP-Rh, invented by Nobel laureate Ryoji Noyori. The production of l-menthol has reached 1,000 t annually -. Though chemical synthesis has been successfully commercialized, biosynthetic methods still attract much attention due to the advantages of high activity, mild reaction condition, little pollution, and excellent purity of product, and more importantly, the l-menthol produced is much closer to the natural product. Researchers from South Africa have developed a biosynthetic process for preparation of l-menthol by lipase-catalyzed kinetic resolution of dl-menthol at a scale of kilogram ,. Other biosynthetic approaches, including enantioselective esterification, transesterification, and hydrolysis, have also been reported -. In our laboratory, using racemic menthyl acetate as the sole carbon source and combining the strategy of habituated culture with increasing substrate concentration, a bacterial strain of Bacillus subtilis ECU0554 was isolated from soil samples, which exhibited very high substrate tolerance (100 g l−1, 0.5 M) and excellent enantioselectivity (E > 100) . The esterase (BsE) catalyzing the enantioselective hydrolysis of dl-menthyl acetate was cloned and overexpressed in Escherichia coli. The free BsE was not very stable, and its stability was improved by immobilization in the form of cross-linked enzyme aggregates (CLEAs) . The thermostability of the immobilized BsE at 30°C was increased by 360 times, with only 8% activity loss after 10 cycles of repeated use in enzymatic resolution of dl-menthyl acetate. The solubility of dl-menthyl acetate in mono-aqueous phase was very low, and ethanol was added as cosolvent to improve the substrate solubility . Although BsE showed relatively high substrate tolerance, the conversion decreased sharply with increase of substrate concentration from 1 to 3 M in mono-aqueous system, which might be due to the severe inhibition of enzyme activity at extremely high concentration of substrate or product. Organic-aqueous biphasic system was usually adopted to increase the substrate load and relieve the substrate/product inhibition . The addition of surfactant could facilitate the dispersal of the water-insoluble substrate through the formation of micellar system and improve the mass transfer of substrate , which is beneficial for the enzyme enantioselectivity . As well known, the increase of substrate concentration can often effectively facilitate the downstream separation and reduce the cost of the product. Additionally, immobilized enzymes are insoluble in the reaction medium, thus avoiding contamination of the product, which is feasible for separation and simplifies the downstream process. Hence, in this work, enzymatic hydrolysis of dl-menthyl acetate at an extremely high load using the immobilized CLEA-BsE was investigated to establish a promising bioprocess for large-scale production of l-menthol. dl-Menthol was purchased from Alfa Aesar (Tianjin, China), and dl-menthyl acetate was synthesized as described before . All other reagents were obtained commercially and of analytic grade. The immobilized BsE was prepared as described previously . The crude BsE (10 g powder) was dissolved in 500 ml potassium phosphate buffer (KPB, 100 mM, pH 7.0), then 250 g (NH4)2SO4 was added slowly with gentle stirring at 0°C and continuously stirred for 10 min. A 25% glutaraldehyde solution (12 ml) was added to the mixture. The suspension was stirred at 0°C for 3 h, and the resultant immobilized BsE was separated by centrifugation (6,000×g, 4°C, 5 min). After washing twice with KPB, the collected immobilized BsE was lyophilized for later use. For BsE activity assay, the BsE was appropriately diluted in 1.0 ml KPB (100 mM, pH 8.0) containing 10 mM dl-menthyl acetate and the reaction was performed at 30°C, 1,000 rpm for 10 min. Then 500 μl of reaction mixture was extracted with same volume of ethyl acetate, and the conversion of l-menthyl acetate was determined by gas chromatography (GC) analysis for the activity assay. The reactions were performed in a 25-ml jacketed reactor with 10 ml of medium system. For mono-aqueous system, KPB (pH 8.0, 200 mM) containing 10% ethanol was used, and for organic-aqueous biphasic system, the volumetric ratio of KPB (pH 8.0, 200 mM) and organic solvent was 4:1. dl-Menthyl acetate was added together with the immobilized BsE. Surfactant was also added in some cases. The reactions were performed at 30°C with magnetic stirring at 300 rpm. The pH of reaction mixture was controlled at 8.0 by automatically titrating 1 M NaOH. Samples were withdrawn for GC analysis. Into a 250-ml, three-necked flask, 59.4 g dl-menthyl acetate, 5.5 g immobilized BsE, 0.25 g SDS, 80 ml KPB (pH 8.0, 200 mM), and 20 ml n-pentanol were added. The reaction mixture was incubated at 30°C and agitated at 300 rpm. The reaction pH was controlled at 8.0 by automatic titration of 1 M NaOH. After a certain period of time, samples were withdrawn for GC analysis. After 84 h of reaction, immobilized BsE was removed by filtration. The organic phase was separated and distilled under vacuum. A flash chromatography of the residue was performed on a silica column using a mobile phase of petroleum-ethyl acetate (10:1, v/v) to get chemically pure l-menthol. GC analysis was performed as described previously . The samples from the hydrolysis reaction mixture were analyzed on a GC-14 gas chromatography (Shimadzu, Kyoto, Japan) equipped with an FID detector. The enantiomeric excess of substrate (ees) was determined using Beta Dex™ 120 chiral column (30 m × 0.25 mm, 0.25 μm film thickness) from Supelco (Bellefonte, PA, USA) using N2 as carrier gas. The temperatures of column, injector, and detector were held at 130°C, 280°C, and 350°C, respectively. The enantiomeric excess of product (eep) was determined using Gamma Dex™ 120 chiral column (30 m × 0.25 mm, 0.25 μm film thickness) also from Supelco (USA) using N2 as carrier gas. The injector and detector temperatures were held at 280°C and 350°C, respectively. The oven temperature was programmed from 110°C, held for 15 min, then raised to 150°C at a rate of 10°C min−1 and finally held at 150°C for 1 min. The ees, eep, substrate conversion, and enantioselectivity were calculated according to the equations of Chen et al. . The conversion was calculated as c = ees/(ees + eep) and the E value was calculated as E = ln[l − c(l + eep)]/ln[1 − c(l − eep)]. The activity (turnover number) of the free BsE was determined as 1,304 s−1 (towards l-menthyl acetate), and the activity recovery of the immobilized BsE was as high as 70%. Immobilized BsE could efficiently catalyze the enantioselective hydrolysis of dl-menthyl acetate to produce l-menthol in mono-aqueous phase containing 10% ethanol. As shown in Figure 1, at a substrate concentration of 1.0 M, 41% of the racemic substrate can be hydrolyzed within 8 h. However, when the substrate loading was further increased to 3 M with a constant ratio of S/C (substrate/catalyst, g/g), the reaction proceeded fast at first, and then slowed down sharply. Finally, merely 23.7% of the substrate was converted, indicating extremely high concentration of the substrate or the product might probably inhibit the enzyme activity. Enzymatic hydrolysis of dl -menthyl acetate at varied loads in mono-aqueous system containing 10% ( v / v ) of EtOH. Symbols: (♦) 1.0 M dl-menthyl acetate with 55 g l−1 of immobilized BsE; (●) 2.0 M dl-menthyl acetate with 110 g l−1 of immobilized BsE; (▲) 3.0 M dl-menthyl acetate with 165 g l−1 of immobilized BsE. The reactions were performed at 30°C and 300 rpm. High loading of substrate is very important for biocatalysis since it can reduce the difficulties of product separation and facilitate practical application. However, exorbitant concentrations of the substrate or product may inhibit the activity of free and immobilized BsE, and consequently, prevent the completion of the enzymatic reaction. The application of organic-aqueous biphasic systems has proven to be an efficient approach to solve the problem of inhibition ,. In order to eliminate the inhibition of product l-menthol and realize the complete bioconversion of l-menthyl acetate at high loads, an organic-aqueous biphasic system was adopted as the reaction medium. Several water-immiscible organic solvents with varied log P values were tested at a fixed phase ratio of 1:4 for organic solvent to buffer. The results were shown in Table 1. The biphasic reactions were performed by adding 1.98 g (10 mmol) of dl-menthyl acetate and 0.55 g immobilized BsE into a mixture of 8 ml KPB (pH 8.0, 200 mM) and 2 ml organic solvent at 30°C and 300 rpm for 48 h. The control reaction was performed in 10 ml KPB containing 10% (v/v) ethanol. Unfortunately, compared with the reaction in mono-aqueous phase, the enantioselectivity (E value) of the immobilized BsE decreased obviously in organic-aqueous biphasic system. Even in the best system composed of n-pentanol and buffer, the E value was only 26, far lower than that (E = 63) in mono-aqueous phase using 10% (v/v) ethanol as a cosolvent. The optical purity of the product also decreased from 94% ee to 85% ee. The decrease in enantioselectivity may be attributed to the diffusion limitation of substrate/product in the biphasic system. After the faster-reacting enantiomer (l-menthyl acetate) in the microenvironment of the enzyme was completely converted, the fresh l-menthyl acetate could not swiftly access to the active site of the enzyme due to diffusion limitation. In this case, the enzyme would catalyze the hydrolysis of the slower-reacting d-menthyl acetate, thus decreasing the optical purity of the product (l-menthol). In order to increase the enantioselectivity of the biphasic reaction, surfactants were introduced into the reaction system to improve the mass transfer of the substrate . Four different surfactants were tested, including Tween 80, Triton X-100, Span 60, and sodium dodecyl sulfate (SDS). As shown in Table 2, the enantioselectivities increased slightly with the addition of Tween 80, Triton X-100, or Span 60, but the modulating effects were not so significant. Surprisingly, when 1.5 g l−1 of SDS (an anionic surfactant) was added, the enantioselectivity of the enzymatic reaction was significantly enhanced from 26 to 83, resulting in remarkable improvement of l-menthol enantiopurity from 85% ee to 95% ee. The improvement of enantioselectivity by SDS was also described by Mori et al. . The significant modulation of enantioselectivity is may be due to the fact that SDS has a very high HLB value and a relatively low critical micelle concentration (CMC), which is favorable for forming an oil-in-water emulsion and for solubilizing the hydrophobic dl-menthyl acetate in the dispersed organic phase of the SDS micelles in the aqueous phase. Therefore, SDS was selected for further investigation. The reactions were performed at 30°C, 300 rpm, at pH of 8.0, by adding 1.98 g (10 mmol) of dl-menthyl acetate, 0.55 g immobilized BsE, and 15 mg surfactant into a mixture of 8 ml KPB (pH 8.0, 200 mM) and 2 ml n-pentanol for 48 h.
Subsequently, the amount of SDS as an additive was optimized. The CMC of SDS in an aqueous solution was about 8 mmol l−1 (ca. 2.3 g l−1). As shown in Table 3, the optical purity of the product increased with the increase of SDS concentration up to 2.5 g l−1, beyond the CMC of SDS, where the enantiomeric ratio (E value) reached 155. As the SDS concentration further increased to 5 g l−1, the enantioselectivity of the reaction did not increase obviously. On the other hand, the conversion decreased significantly, perhaps due to the denaturation/inactivation of the enzyme resulting from the existence of excessive SDS. Therefore, the optimal concentration of SDS was chosen as 2.5 g l−1. The reactions were performed at 30°C and 300 rpm for 48 h by adding 1.98 g (10 mmol) dl-menthyl acetate, 0.55 g immobilized BsE, and a varied amount of SDS into a mixture of 8 ml KPB (pH 8.0, 200 mM) and 2 ml n-pentanol. Under the above optimized conditions, the enantioselectivity of biohydrolysis was significantly enhanced. Enzymatic hydrolysis of dl-menthyl acetate at high concentrations of 1 to 3 M was reexamined. As shown in Table 4, when the substrate loading was increased from 1 to 3 M, the final conversions were maintained at a high level (over 40%) with a constant ratio of S/C, though the reaction time was extended to some degree. The optical purities of the produced l-menthol were also quite satisfactory, all better than 97% ee. The reactions were performed at 30°C and 300 rpm for 48 h by adding different concentrations of dl-menthyl acetate, 0.55 g immobilized BsE, and 25 mg of SDS into a mixture of 8 ml KPB (pH 8.0, 200 mM) and 2 ml n-pentanol. The initial reaction rate at various stirring rates was determined, as shown in Figure 2. When the stirring rate increased from 200 to 300 rpm, the reaction rate increased sharply from 23.8 to 77.8 mmol l−1 h−1; however, when the stirring rate further increased to 500 rpm, no obvious increase in the reaction rate was observed. Since the concentration of SDS has reached its CMC, normal micelles could be formed rapidly at a relatively high stirring rate, thereby facilitating the solubilization and diffusion of the hydrophobic substrate, which in turn will result in higher reaction rate. As a result, 300 rpm was employed for further investigation. 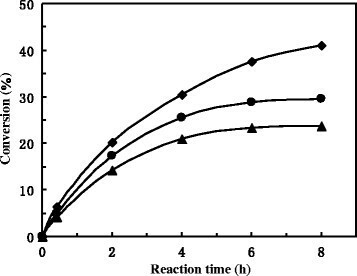 Initial rate of dl -menthyl acetate hydrolysis at various stirring rates in biphasic pentanol-buffer system. The reactions were performed at 30°C and varied stirring rates, by adding 0.55 g immobilized BsE and 25 mg SDS into a mixture of 8 ml KPB (pH 8.0, 200 mM) and 2 ml n-pentanol. The repeated use of the immobilized BsE was also investigated. After one batch of reaction, the immobilized enzyme was collected by filtration and reused in the next cycle. It should be noted that no activity was detected in the filtrated aqueous phase. After three batches of reaction, the initial reaction rate decreased to 45%, as shown in Figure 3. As compared with the 8% deactivation after 10 cycles of reaction in mono-aqueous phase , the fast deactivation might be attributed to the protein-denaturing role of the anionic surfactant SDS. Repeated use of the immobilized BsE. The reaction was performed in a 50-ml three-necked flask containing 5.94 g dl-menthyl acetate, 25 mg SDS and 8 ml KPB (pH 8.0, 200 mM) and 2 ml n-pentanol, at 30°C and 300 rpm with mechanical stirring. After 24-h reaction, the reaction was terminated by filtration, and the recovered immobilized BsE was reused in next batch of reaction. 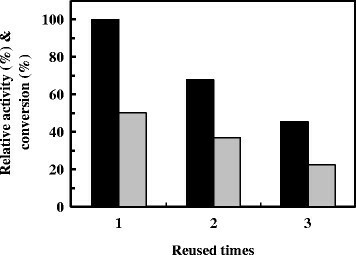 Symbols: black square, relative activity (%); gray square, conversion after 24-h reaction. To evaluate the feasibility of the biocatalytic process for practical application, the BsE-mediated reaction was scaled up to 100 ml, with a substrate load of 3 M (594 g l−1). The biocatalytic process was identical to that at 10-ml scale, reaching 41% conversion after 84 h with an eep of 97%. After the reaction was terminated, the reaction mixture was filtrated under vacuum. The filtrate was divided into two phases immediately, without forming any emulsion which is frequently encountered in the case of free enzyme-catalyzed reactions. The organic phase was separated, then the solvent was removed by vacuum distillation, and finally the crude product was further purified by silica gel column chromatography, affording 17.3 g l-menthol (97.2% ee), in a yield of 37% (the theoretical yield is 50% at maximum). Therefore, the biocatalytic process developed herein should be feasible for efficient transformation of highly loaded dl-menthyl acetate, demonstrating a good prospect for practical application in l-menthol manufacturing. It has been proven that the use of immobilized BsE as a robust biocatalyst can perfectly catalyze the enantioselective hydrolysis of dl-menthyl acetate. In order to increase the substrate loading and to diminish the inhibition of enzyme activity by the product, an organic-aqueous two-phase system was adopted. To address the enantioselectivity decrease issue, several surfactants were tested for improving the mass transfer limitation between the two phases. Unexpectedly, anionic surfactant SDS as an additive could enhance the enantioselectivity from 26 to more than 150. By adopting these strategies, a high-performance bioprocess was successfully constructed for preparative synthesis of l-menthol with 97% ee. The substrate loading was as high as 3 M (594 g l−1), affording a very high space-time yield of 198 gl-menthol l−1 day−1. Compared with the reported enantioselective enzymatic esterification of dl-menthol - and hydrolysis of dl-menthyl propionate , the substrate loading was much higher. These results inspire us to explore the possibility of industrial biocatalysis in large-scale production of l-menthol. The financial supports by the Ministry of Science and Technology, P.R. China (Nos. 2011AA02A210 and 2011CB710800), and the Open Fund of State Key Laboratory of Bioreactor Engineering (2060204), are gratefully acknowledged. G-WZ designed the study and responsible for the revision of the manuscript. Professors J-HX and QY provided the experimental guidance and manuscript revision. JP, N-DD, and BC conducted the experiments and JP drafted the manuscript. All authors read and approved the final manuscript.